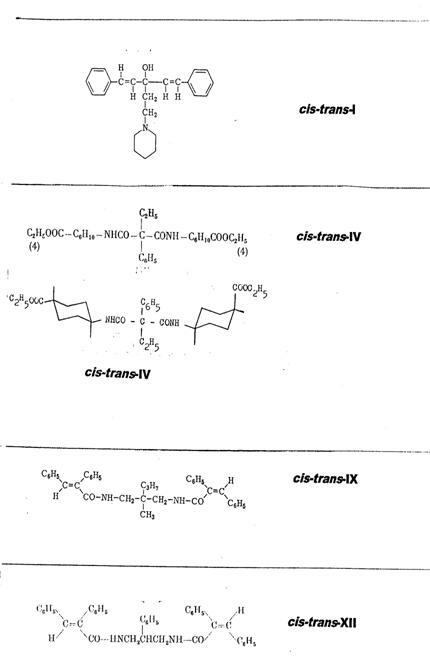 In connection with the synthesis of cis-trans asymmetric compounds [Fig. 1 (1)] the author had discussed, among other things, the stereochemistry of heptites in lectures of 1941 (10), 1948 and later (2,3,4). According to the opinion prevalent at the time, this was first considered as an extension of the pentite problem and later under new aspects, hitherto published only in lectures. Looking at the heptite formulae reduced to 5 C atoms in Plate 1, we will find two different types of substitution, namely those which differ by so-called enantiomeric groups (as in pentites) and those which differ by diastereomeric groups. In Plate 1, the OH groups are indicated by a line ---, the CH2OH groups have been left out. The numbering 1 to 5 is applicable to pentites where C3 is in the middle, but also for heptites when the CH2OH terminal groups are left out: middle, actually C4. Below the formulae: physical data of well-known heptite isomers; cf. also key to Plate 3 and Plate 3 itself. We speak of cis-trans asymmetry in the case of a so-called asymmetric C-atom if two of its four different substitutents are geometrically isomeric, but symmetric: Fig. 1. In 1955 - 64, it proved possible to realize several such cases where geometrical and optical isomerism coincided, summarized in Plate 2. The consequences resulting from these observations are the following: While the C atom in the middle is not a so-called asymmetric one in all representatives of Type I, but it is in all representatives of Type II. Therefore, Type I a and Type I b each are an analogue of the pentite problem with all related consequences. The situation is quite different for the representatives of Type II. These are compounds with 5 so-called asymmetric[ii] C-atoms of which two each have the "identical position". It is evident right away that, in Type I, only the symbols A or B appear, while, in Type II, there is always a combination of A and B which then causes asymmetry at the middle C atom. Some of the simplified experimental plans derived from these model observations are shown in tables 1 and 2; in these two hitherto unpublished tables model experiments on suitable systems are to be proposed. 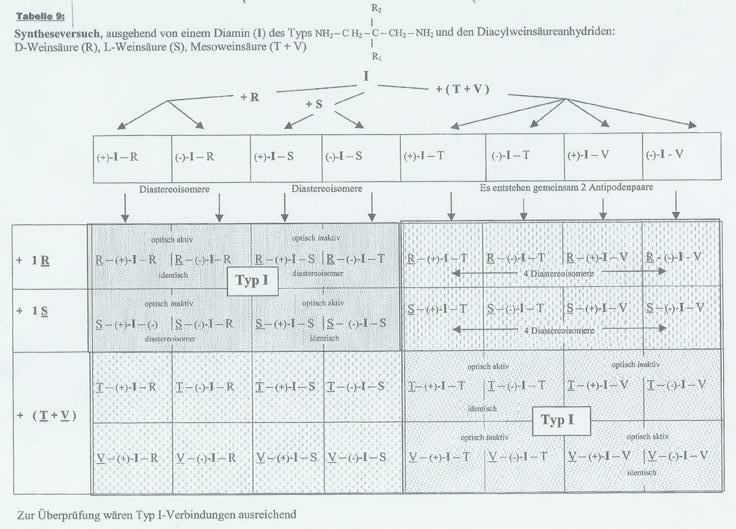 Here the hanger/pendant-principle (“Anhänger/Aufhänger-System”) we have developed will be useful for implementing the model experiments outlined in these tables and relating to the heptite problem (6). This is made possible by the experience of many years gained with the synthesis of the cis-trans asymmetric compounds. Experimental trials based on the considerations and model evaluations from the years 1948-51 (2, 3, 4) outlined here (Plate 1, Table 1 and 2) were to form the basis for the post-doctoral thesis of a proven co-worker -- at the end of the 60s after the problem of cis-trans isomery had been solved [1955-64 (1): Plate 2]. Regrettably, this habilitation was prevented by the university reform of 1969 and its consequences even though this work was secured by a habilitation scholarship. The co-worker concerned had recognized the negative consequences resulting form the "democratisation" of the "Free" University at the time and left immediately -- as did many of the degraded professors. In the course of the reform, 800 people were appointed professors by law in August of 1969. They were referred to as the so-called "discount" or "August" professors, some of whom "will live off the taxpayer well beyond the year 2000". This is what Prof. D.A. Lüttringhaus said 1969 to the author and his remaining co-workers in a telephone call from Freiburg. In the course of the democratisation of the Free University, the faculties and all institutes (including their directors) had been “eliminated” and “split” into ca. “20 Fachbereiche, 5 Zentralinstitute, in viele, viele wissenschaftliche Einrichtungen und Arbeitsgruppen (work groups)”. Operating an institute as in the past with wide-spread scientific activities was no longer possible in the work groups who were subject to severe restrictions both thematically and financially. Major purchases of apparatuses had to be applied for at least two years in advance. Such applications then had to pass the “zuständige Direktorium der wissenschaftlichen Einrichtung, die Forschungskommision, den Zentralinstitutsrat bzw. Fachbereichsrat und später das Abgeordnetenhaus (Parliament of Berlin)” with the result that co-workers in the meantime left and urgent work was exported to other universities or even abroad. Luckily, the author had found new alternatives for continuing some of his research, partly in Brazil in the Chemical Central Institute of the Brazilian Federal University Santa Maria (UFSM) organised and developed under his guidance, and partly in the industry in Germany, Japan and the United States (6). Unfortunately, the planned experimental work described in this essay was never carried out. The author hopes that a scientist will be found who will verify by experiments and implement the proposals made in Tables 1 and 2. 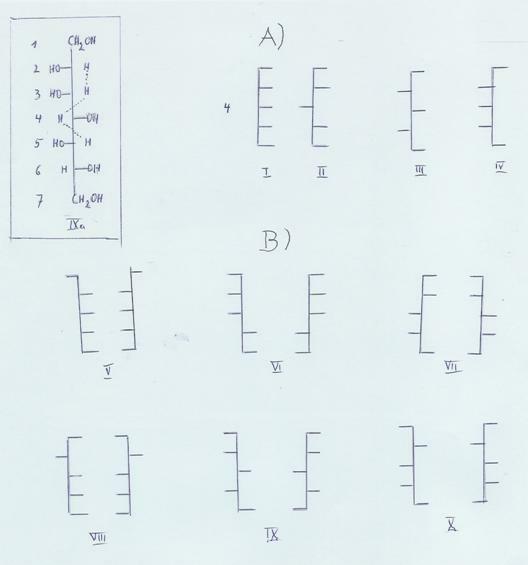 After these tables follow plates 2 and 3 and then in APPENDIX the plates 4-6. For realization the dotted underlined components would be sufficient. For realization Typ I component would be sufficient. Zur Synthese der genannten cis-trans-asymmetrischen Verbindungen hatten wir ein sog. Aufhänger-Anhänger-Prinzip entwickelt (6). Als Aufhänger im Falle von cis-trans-IV eignete sich die Dicarbonsäure I (x = 0), als Aufhänger im Falle von cis-trans-IX diente das Diamin II (x = 1). This plate with key, and plate 4-5, are serving to explain: Nomenclature of the heptite isomeres, their synthesis and properties -- as far as is known. 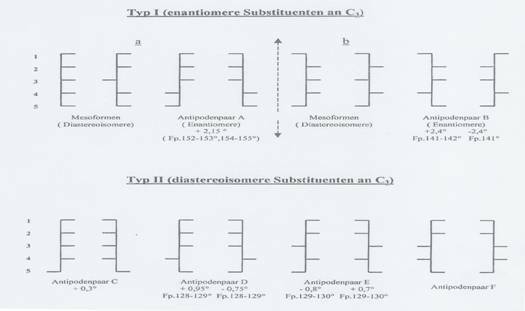 According to Pl 1: 16 stereoisomere Heptites are possible, that is to say 4 mesoforms and 6 pairs of antipodes -- in the following discussed in Pl. 3 under number I to X and in the key to Pl 3 where you find data for their synthesis[iii]. The basis for “heptite nomination” is the hexoses survey, the so-called “Kohlenhydrat-stammbaum der Hexosen”, shown in Plate 4. I entsteht bei der Cyanhydrinsynthese aus D-Allose nach Reduktion mit RANEY-Nickel über D-Glycero-D-alloheptono-γ-lacton, Reduktion mit Na-Amalgam zur D-Glycero-D-alloheptose und deren Reduktion mit RANEY-Ni zum Heptit I. – Formel der D-Allose in Pl. 4. Synthese nach J W PRATT, N.K.RICHTMYER, J Amer Chem Soc 77, 6326 (1955). II: D-Glycero-D-guloheptit (L-Glycero-L-guloheptit) oder D-Gluco-α-heptit entsteht aus D-Glucoheptulose durch Reduktion mit Na-Amalgam bzw aus L-Glucoheptulose durch Druckhydrierung. Synthese nach F L HUMOLLER et al, J.Amer Chem Soc 61, 3372 (1939) bzw W D McLay et al, ebenda 64, 1608 (1942). 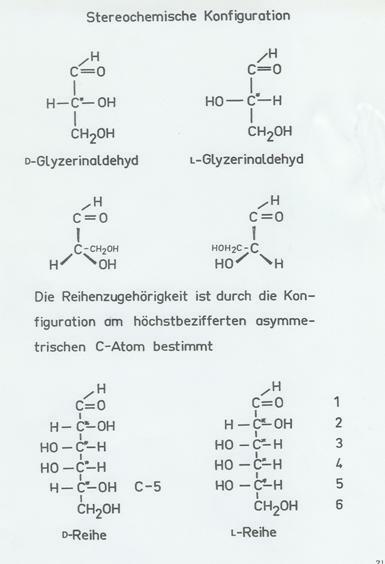 ([α] +0,3°; c: 1,2; H2O) nach JW PRATT, J.Amer Chem Soc 77, 6326 (1955). On the following page: plate 6, a discussion of the term “pseudoasymmetric C-atom”; cf. also footnote [ii] about “asymmetric C-atom”. Der Begriff des pseudoasymmetrischen C-Atomes wurde zu einer Zeit geschaffen, in der das asymmetrische C-Atom praktisch allein zur Erklärung der optischen Aktivität einer Verbindung herangezogen wurde und man die Anwesenheit eines asymmetrischen C-Atomes als alleinige Ursache der optischen Aktivität ansah. Das pseudoasymme­trisehe C-Atom -- nach der Definition von Werner mit vier verschiedenen Substituenten besetzt, von denen zwei stofflich und strukturell gleich und entgegengesetzt asymmetrisch gebaut sind -- kann selbst nie Träger der optischen Aktivität sein, weil es immer das Zentrum eines symmetrischen Moleküls bildet. Die gleichen Verhältnisse liegen bei der von Baeyer aufgefundenen­ relativen Asymmetrie vor, die auf cyclische Ver­bindungen beschränkt ist und sich von der Pseudoasymmetrie nur dadurch unterscheidet, daß sich im Molelkül keine­ asymmetrischen C-Atome befinden und die relativ asymmetrischen C-Atome in einem Molekül immer von der Anwesenheit eines anderen__relativ asymmetrischen C-Atoms abhängig sind. Da die optische Aktivität einer Verbindung eigentlich nur von der Asymmetrie des Gesamtmoleküls abhängig ist, ist das asymmetrische C-Atom nur ein Spezialfall[vi] der Molekular-asymmetrie, bei welcher man die Asymmetrie des Gesamtmoleküls auf ein bestimmtes C-Atom (oder auf bestimmte C-Atome) zurückführen kann. Unter diesem Gesichtspunkt sind die Begriffe “pseudo­asymmetrisches C-Atom” und “relative Asymmetrie” überflüssig. Zur Erklärung der optischen Aktivität sind sie nicht zu verwenden, da sie ausnahmslos in symmetrischen Molekülen vorkommen. Es besteht kein Grund, für diese, sich durch keinerlei besonderen Eigenschaften auszeichnenden Fälle, eine eigene Bezeichnung zu wählen. Vortrag I vor leitenden Wissenschaftlern der MONTECATINI-Werke in Mailand, Via Turati, am 20.4.1951, während meines einmonatigen Aufenthaltes in Mailand auf Einladung der Montecatini-Werke (in italienischer Sprache). 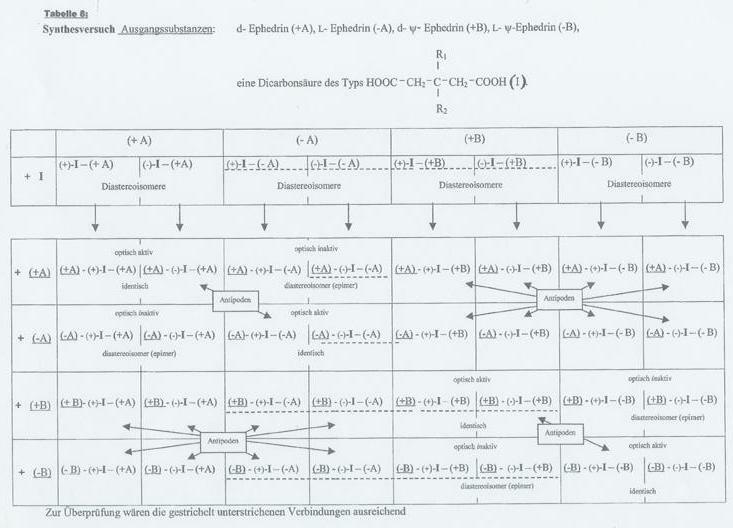 Die hier genannten Ausarbeitungen über Heptite und analoge Verbindungen (vgl. auch Tabellen 1 und 2) bildeten die Grundlage für eine geplante Habilitationsarbeit; diese sollte nach Realisierung von Fällen der “cis-trans-Asymetrie” durchgeführt werden. Leider kam es infolge der “Universitätsreform im August 1969 nicht zur Durchführung derartiger Untersuchungen. Das erwähnte Habilitationsthema war von der Deutschen Forschungsgemeinschaft für meinen langjährigen Mitarbeiter Dr. E.B. Grabitz bewilligt worden; wegen der zu erwartenden Universitätsreform ist dieser vorzeitig nach Italien emigriert. Eine Übertragung der Bewilligung auf einen anderen promovierten, geeigneten Mitarbeiter entfiel jedoch, da auch diese das neue Universitätsgesetz als wissenschafts-vernichtend voraussahen. The texts of the lectures (2-4) remained unpublished at the time at the suggestion of professors Dr. Richard Kuhn and Dr. A. Lüttringhaus, because they contained substantial references to the further work of the author. Plate 1 and the Tables 1 and 2 were shown as slides in the lectures. Manuskript Januar 1951, 29 S.
vgl. auch Vorträge und Exposé aus den Jahren 1943 und 1948 (6). Summary of lecture in Pl 6, published in (6), there in PROJ II 9,4. [i] Continuation of the observations made under quotation (1), including earlier references to the topic "cis-trans- asymmetry", e.g. Comm. V-XII. Comm. I cited under (9). 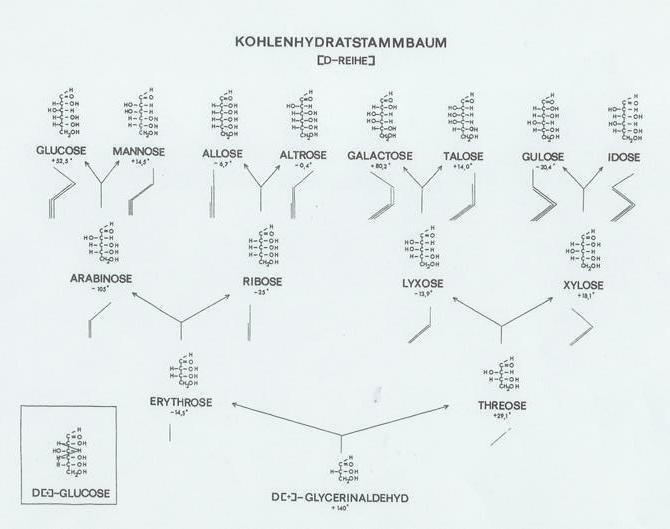 [iv] Pl 4 and 5 taken from R.Riemschneider, „Material für biochemische Einführungsvorlesungen“ 1969 (1.Auflage), S. 20, 21; Druck: W.Hilke KG, Berlin 30.